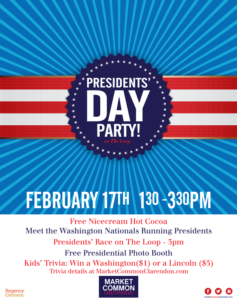 Presidents’ Day with the Nats’ Running Presidents! 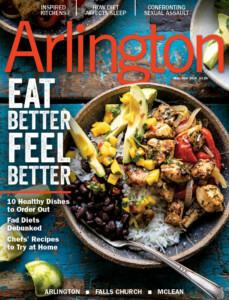 Join us on The Loop on Sunday, February 17 from 1:30 to 3:30 p.m. as The Washington Nationals Running Presidents take over Market Common Clarendon! Take a selfie with George, Tom, Abe, and Teddy from the Washington Nationals, and then watch them race around The Loop at 3 p.m. We’ll have a photo booth with presidential props, complimentary hot cocoa from Nicecream, and kids under 13 can spin our prize wheel to win a paper George ($1 bill) or a Lincoln ($5 bill).